Please leave a message, if you have any questions, wanna have a discussion and most important: if you know peace projects i should write about. Thank you! For more information about me and my reasons have a look here: About Let’s Peace. My name is Gabi. I was born 1984 in East Germany, studied Social Science and Education Science at the University of Leipzig. At the age of 16 i created my first website on worldpeace. My idea on the world was a very easy one: love and peace is good, war and violence is bad. For i didn’t understand that life is much more complicated, i divided everything in black and white. As i grew older I learned to understand that we all have an impact on how the world is constructed. I realized, that the way i am thinking (and judging) is important in the process of peace. 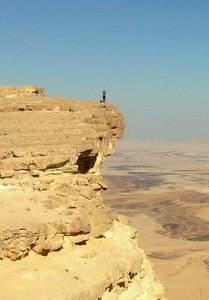 On the picture you see me at „Machtesh Ramon“ (a big kind of crater in Israel’s Negev desert).